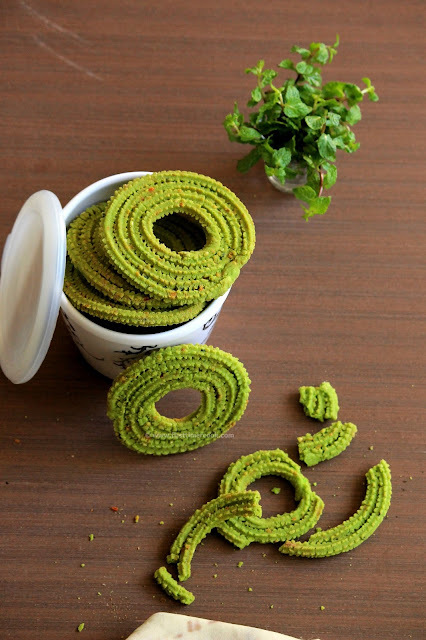 Chakli is a crunchy, spiral shaped, savory snack famous all across India. Typically this is made from a variety of flours which may be only Rice Flour or rice flour with gram flour or rice flour with black gram / urad dal flour etc. So it has several variations, depending on the types and proportion of flours used. In southern part of India, these chaklis are also named as Murukku which is made without the gram flour. Basically the flours and some spices are mixed, then boiling water is added to make a firm dough. Next the dough is kneaded and using a mold, shaped into spiral shape. The shaped dough is finally deep fried in hot oil over medium heat, until it cooks from both sides. Then it is removed from the oil, placed over a tissue paper to cool completely and stored in an air tight container. The chaklis are mostly like pretzel, but instead of having smooth surface these are spiked ones. Here, I have added some Mint flavors to the chakli where also I have opted to only rice flour. 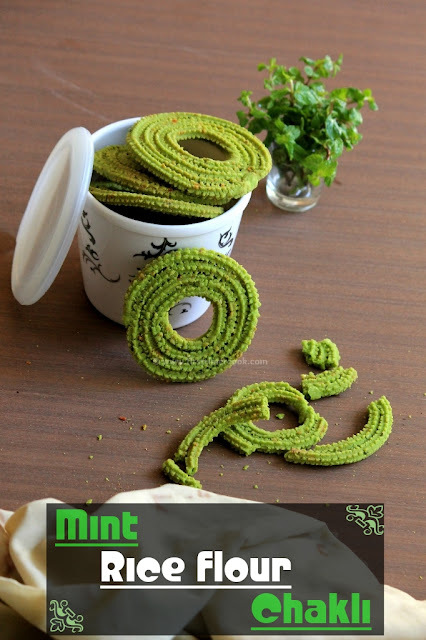 The mint rice flour chakli, a simple green colored spiral savory snack is such a healthy and tasty snack loved by any age group from kids to adults. This is the easiest chakli I have come across. This needs very few ingredients like rice flour, smooth paste of mint leaves, butter and some spices. 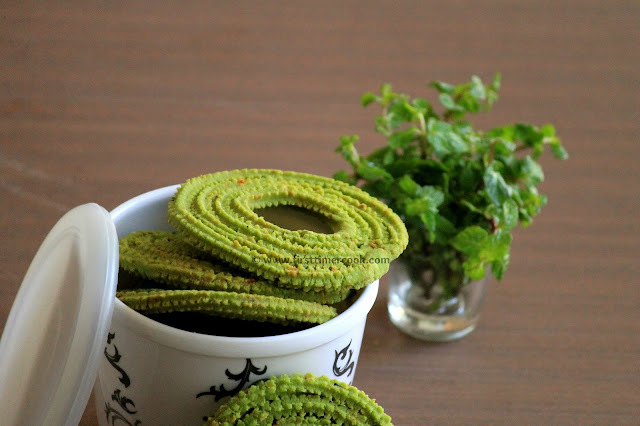 Also this chakli can be very easily and instantly made with a strong mint flavor. 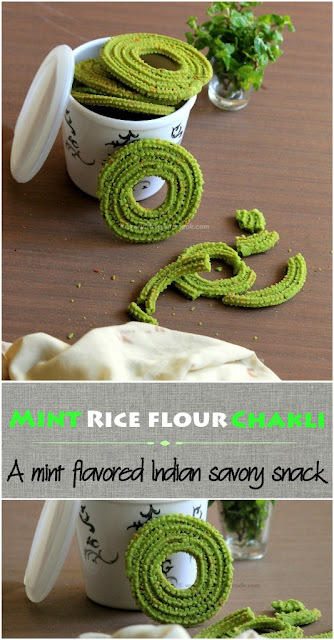 The mint rice flour chakli is best suited for between-meals hunger pangs, just take out from air tight container and munch simple as it is or with a cup of tea. Any combination of flour can be opted as mentioned above, though I have just used only rice flour enhanced with mint leaves, sesame seeds, some chili flakes. Red chili or green chili paste can also be used. This tempting twisted version of south Indian chakli is very easy to prepare and a good festive savory dish particularly festivals like diwali. So lets go in details. First thoroughly clean mint leaves (only the leaves part). Then make a paste of mint leaves in a blender along with little amount of water. Do not add much water, even prefer not to use water to make the paste. In a mixing bowl, take rice flour. Add the mint paste and mix well, so that a crumble texture will form. Next add sesame seeds, chili flakes, butter and salt. Mix well. Add boiled water to this mixture. Give a quick mix using a spoon and keep aside covered for 15-20 minutes. Then knead it to make a smooth dough without any cracks. Take a well greased chakli mold attached with star shaped hole. Stuff a portion of the dough inside the mold and slowly press in circular motion on a plate lined with plastic sheet till the desired spiral size is reached. Make 4-5 no. of circular shapes at a time. Carefully slide each one onto the hot oil. Allow them to cook over low-medium heat on both sides completely without changing it’s color. Drain out the chaklis onto paper napkins to remove excess oil. Repeat to make chaklis from rest of the dough. 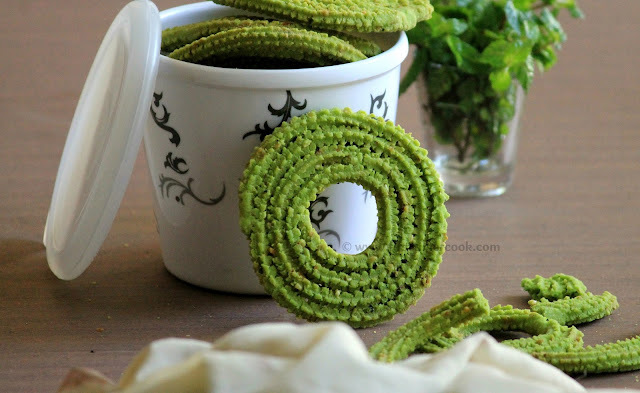 Allow to cool completely, then munch these crispy mint flavored chaklis or store in an airtight container for later ! Always grease the chakli mold before making chaklis. The dough should be firm, neither soft nor sticky. Otherwise the chaklis'll not shape properly. The temperature of the oil also should be perfect, that means always deep fry the chaklis on low-medium heat. Else on low heat, chaklis'll absorb oil and over high heat, the color of the chaklis'll become dark brown easily. Since only rice flour is used here, so be careful while making the chaklis. Because this flour doesn't have enough gluten inside it. Chili flakes can be avoided if preferring for kids snacks.